An overdue memorial to the forgotten achievements of Toronto’s twentieth-century avenue of enterprise. 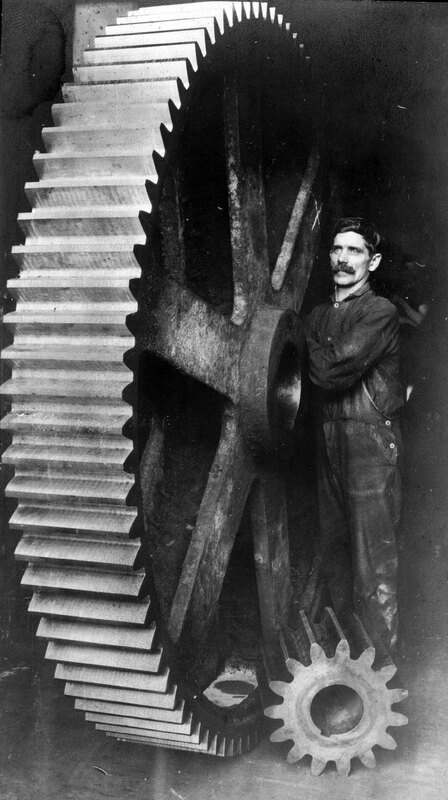 A machinist poses with Hamilton gears, circa 1913. On October 17, 1994, Donald Weston drove from his North York home to the industrial plant on Dupont Street in central Toronto where he had been employed since 1952. He brought with him a borrowed video camera and, just outside the main door, switched it on, briefly photographing an iron plate identifying the premises as Hamilton Gear, 950 Dupont. With the camera still rolling, he mounted a couple of steps, opened the door and went in. Room by room, Weston, aged sixty-two, proceeded through the factory, letting the tape run. He walked down a long, fluorescent-lit corridor of shelves loaded with the tools, materials, and equipment of twentieth-century machine-making. He went through a workshop where men standing on a floor sprinkled with metal shavings were attending whirring, spinning lathes cutting teeth into gear blanks—disks of metal sliced, in another process, from heavy rods of tempered steel or bronze. Weston climbed down stairwells with his camera on his shoulder, recording walls displaying framed photographs of company products. He paused at one picture of a gear about the size of a very large round of cheese. Its hefty teeth are engaged with those of a “worm drive,” a tube-shaped gear resembling a giant piece of fusilli. The assembly has a satiny, silvery sheen, and in the film is being inspected by a thoughtful-looking man in glasses and overalls. Weston made his way through the company’s administrative offices on the second floor along the Dupont Street side of the plant. Telephones warble now and then, voices can be heard, and a lone secretary says “smile.” Weston moved along, recording jerky glimpses of floors and drop-ceilings and hallway drinking fountains. He went into the company’s vault where, he later recalled, nothing more or less valuable than the details of client orders from the last eighty-three years were stored on reels of microfilm and in thick paper files. Descending into the bowels of the plant, past a Keep Door Closed sign, he entered a dimly-lit furnace room where boilers and compressors groaned and toiled, and where a hole in the floor contained a pool of water, ten feet across and twenty feet deep—“the swimming pool, we called it”—where at one time gears heated red hot in an oven were hoisted for a sudden, sizzling quench to harden their alloys. By accident, the camera was aimed toward large, south-facing factory windows that let in so much light the image on the tape was momentarily whited-out before the aperture adjusted to reveal more of the flotsam of a machine shop: hoses, rods, wheels, pulleys, metal drums—not all of it in orderly storage. At many stops along the way, Weston, his camera’s red recording-light blinking, was greeted by co-workers. “What’s this about? ” asked a shipper. Following more light, Weston emerged into a vast room, larger than a high-school gymnasium, with a ceiling four storeys high. Splashes of bright orange and blue—the painted surfaces of various walls and posts and pieces of machining equipment—seem to glow, since the big shop is flooded with daylight admitted through walls sheathed entirely in panels of green-tinted glass. Employees called this “the greenhouse.” The boxy building’s skin of glass panes in industrial sash is hung on a structure of steel girders whose thinness is deceptive, for dangling from ceiling girders are huge trolleys and hooks used, Weston will later note, for lifting industrial gears more than twenty feet in diameter and weighing tons. Machinists in another shop smiled, but said little. “What’ve you heard? ” someone asks. “That we’re going to close down? ” When he was done, Weston went back outside, stood on at the corner of Dupont Street and Dovercourt Road and, with the camera’s eye, recorded for posterity the For Sale sign that hung high on a west-facing wall. 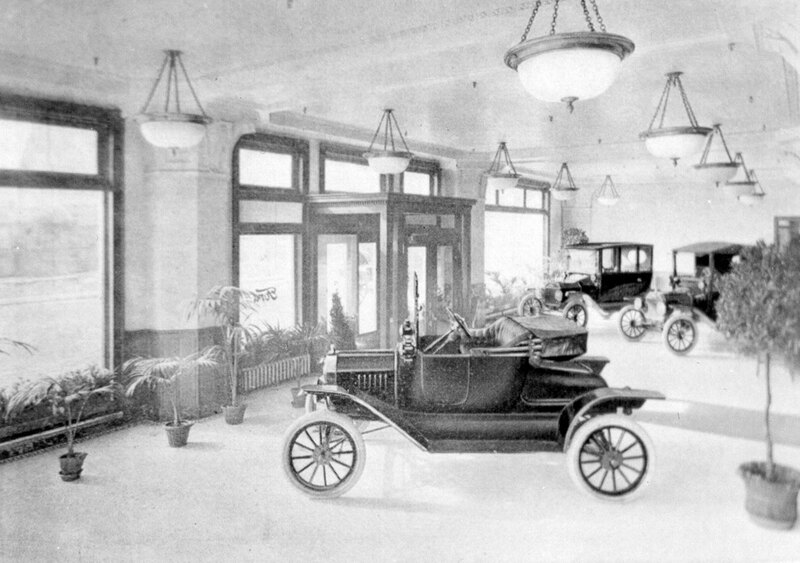 The former showroom of the Ford Motor Company, 672 Dupont. Indeed, the twentieth was supposed to be Canada’s century, and you’d be hard-pressed to find another street in the Dominion where people worked as industriously to make it so. At scales minute and massive, Dupont created: “Davenport Works, Toronto, builds power, distribution, welding, furnace, instrument, control and street-lighting transformers,” declared General Electric, describing, in a nineteen-thirties-era booklet, the sprawling factories between what is now Dupont Street and Davenport Road, along Lansdowne Avenue. In the illustrations, which include a bird’s-eye view reminiscent of nineteenth-century line drawings which greatly exaggerated the size of factories, smokestacks and even clouds of smoke, G.E. showed eight railroad tracks servicing its smoke-belching complex of buildings and yards next to the Canadian Pacific Railway’s North Toronto line, paralleling Royce Avenue, today’s Dupont Street. Electrical transformers weighing up to two hundred and thirty tons, whose cores and coils could be hung like mere meat on hooks and jigs from the factory’s beams, were manufactured here. One publicity picture showed a “thirty-six-thousand kilovolt-ampere three-phase transformer” emerging from the Davenport Works on C.P.R. flatcar No. 309926 which, due to its cargo’s height and weight, “had to be routed over more than one thousand additional miles to reach its destination.”4 Such freight may have had something to do with the P.C.B.s whose toxic presence later held up the site’s redevelopment—one price ultimately paid for the utility derived. Not noted by G.E. was the Davenport Works’s previous lifetime as Canada Foundry Company, whose metal products were poured, hammered and molded under earlier, more Dickensian circumstances, but had more delicate, aesthetic applications. Two fanciful dragons (or “grotesque animals” as the inch-thick, cloth-bound Canada Foundry catalogue called them) once guarded the grand stairway in Old City Hall’s lobby. Part horse, part fish, and dressed in flowing vegetation, they were designed by Toronto’s foremost architect of the Victorian age, E. J. Lennox, and “executed in hammered iron,” here. Lost, then found by a city bureaucrat in an antique store, they are now back near Dupont Street, at the Toronto Archives on Spadina Road, presiding over the entrance to the reading room. Proclaimed at dozens of intersections by the new signs was Dupont’s own name, more pedigreed than the street itself: the street was named for George Dupont Wells, “son of Colonel the Honourable J. Wells of Davenport, county York,” whose clout in nineteenth-century Toronto was such that George’s daughter, Nina, daughter-in-law Dartnell, and even his house, Davenport, all had Toronto streets named after them.8 More humble than these folks, on George Dupont Wells’s street, in the twentieth century, was the flow of not only street signs, but eavestroughing, downpipes and highway signage from Rosco’s plant—products made at the intersection of Shaw Street where today a big I.G.A. supermarket provides pop, pasta, and Air Miles. A confident and successful James Kendle, Sr., (with bicycle) and his new coal carrier. Yet Americans held no monopoly on ambitious outlook and productive ritual, as Louis Schmunk knew from his work in Europe and could see every morning at Dupont Street and Lansdowne Avenue, where he would arrive at 8 A.M. sharp to preside over the shift change of his two thousand employees. He was manager of the Canadian porcelain works of one of the world’s early great multi-national companies, American Standard, manufacturer of bathroom fixtures. Born in Russia in 1898, of German parentage, Schmunk was raised in Ohio and earned a degree in ceramic engineering from Ohio State University. His path to what became Dupont Street crossed some momentus events: he was assigned to set up plants in Europe during the nineteen-thirties, and did so in France, Germany and Italy, until dictator Benito Mussolini began making life difficult for Americans and British. Spence remembers watching skilled men manipulating huge sieves, suspended from the ceiling on chains, which were used to shake a glazing powder on cast iron bathtubs that when baked would come out all glossy. The very fine clay used for sinks and toilets came from as far away as China, arriving by rail on freight cars that could be brought in on sidings. Later insurance maps of Toronto refer to American Standard’s kilns as “gas-fired,” but in the nineteen-thirties and nineteen-forties, Spence recalls, they burned coal. When he was nineteen, and working in Switzerland, Benito Mussolini was given an opportunity to emmigrate to America. Unable to decide, he is said to have tossed a coin.11 History might have been different had the coin landed on its other face or, for that matter, if as he later cobbled together his sawdust empire, he’d taken an overseas trip. Riding the Dupont streetcar as it crossed Bloor, Mussolini might have been aghast at the thicket of overhead hydro wires—abhorrent, visible power such as had never existed in Europe’s genteel capitals, where the lines were buried. At Davenport and Dupont there were only billboards and an Imperial Oil station (still there today) for the Duce to contemplate. The dictator’s dismay would have begun at Christie Street, where the Dupont car turned back and he would have been left standing on a dusty TTC loop where the big Loblaws supermarket now stands. His goal would have been to trek west, to see a slice of Canadian and North American industrial might, and from now on he’d walk. Mussolini would have brought a street map, for until the late nineteen-forties, when the city’s streets were widened and many jogs eliminated to facilitate auto traffic, Dupont Street was not a single east-west corridor. Depending on the decade, west of Christie Street it became Warren Avenue, Van Horne Avenue, and finally Royce Avenue—names all relegated, by 1950, to the avenues of history. As Mussolini walked west from Christie Street he would have witnessed the growing, changing character of North American industry. Before coming to the monster factories—American Standard, Dominion Radiator, G.E.’s Davenport Works—he’d have passed smaller enterprises, formidable for their number and variety. There would have been Roofer’s Supply Company—later Rosco, of street sign fame—with metal cutting and shaping shops at Shaw Street. Mussolini might not have noticed the yards of Kendle Coal, west of Christie Street, or the strips of frame dwellings interspersed with the factories along the street west from here. But he would have seen the smoke—not pollution in those days—emanating from stacks at T. Hepburn, an old and busy foundry near the corner of Ossington Avenue. He would surely pick out Hamilton Gear’s long plant wedged between Van Horne Avenue and the C.P.R. tracks. He’d keep walking, past the big plants and on along Royce Avenue, as Dupont Street here was then called, to the subway—not a train, but the railroad underpass where Dupont Street today ends at Dundas Street West. Around here Mussolini would have smelled, as one still could until the nineteen-eighties, the fumes from Viceroy Manufacturing Company (makers of hard rubber, including hockey pucks); paint from the Glidden plant south of Royce; and glue from National Adhesives. He would have had to notice, converging at or within sight of here from all directions, railroad lines. The Canadian Pacific North Toronto line, paralleling what is now Dupont; their double-track Galt subdivision and Toronto, Grey and Bruce line; Canadian National’s Newmarket line and double-track Brampton subdivison.14 Had he paused, he would have noticed that, like clockwork, freight trains passed pulled by massive steam engines, bigger and more powerful than any in Europe, bringing raw materials and taking away finished products with a smooth efficiency that could not but impress the man who, after all, made Italy’s trains run on time. Benito Mussolini could have continued walking and seen even more, but wouldn’t have. The implications of what he had seen would have been clear. Could a war be won against nations backed by the might Dupont Street represented at its zenith? Benito Mussolini would have reached for a T.T.C. ticket in his pocket. He would have dropped it into the fare box on the next southbound Dundas West car. He would have gone home to reconsider his imperial plans. 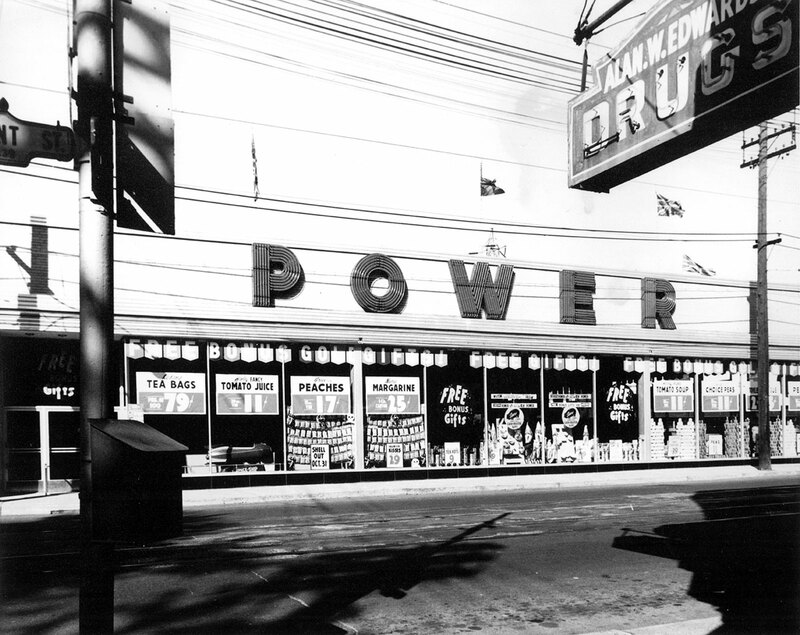 The glass-fronted Power supermarket (now Loblaws) at Huron and Dupont, circa 1958. Mussolini was not yet conceived when James Kendle, early in the eighteen-eighties, took the emmigration gamble and left Newfoundland for Toronto. He put his carpentry skills to work building houses on Palmerston and Manning avenues, where on the latter street he and his young wife, Sybil, a former opera singer from Pennsylvania, settled down at No. 734. 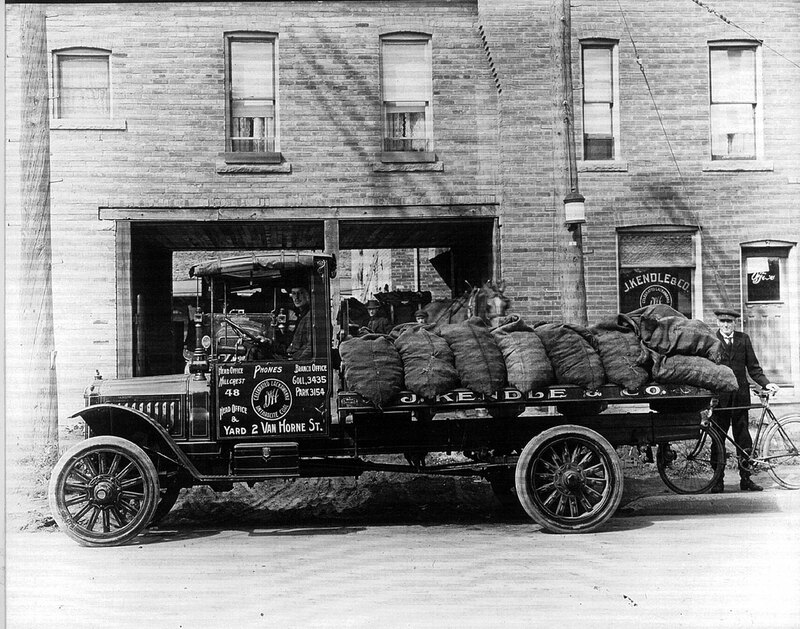 In the off-season, James Kendle hauled coal, which proved lucrative, if also competitive. His grandson, James Kendle, Jr., today estimates there were once three hundred to four hundred coal dealers in Toronto, a good chunk of them on the corridor that is now Dupont Street, which is where the railways brought coal and where the Kendle business grew. The Kendle Coal Company would have two yards, one west of Ossington Avenue and the other west of Christie Street next to where the Ford plant became Planter’s Nut and Chocolate Company, which it remained for decades. As the years went by, Kendle’s edge in this saturated market was the niche he carved out by selling home and business heating customers a special, high-grade Pennsylvania coal. Growing up around a coal yard had its perks. An unlikely one was the Santa Claus Parade, whose route, Kendle, Jr. recalls, at one time followed Van Horne and Dupont streets into midtown before turning south toward Eaton’s. “They would back a coal truck up to the lot line and we’d sit on the back of it and watch.” As a youth helping haul coal, he’d learn the disadvantages: Santa’s November march wreaked havoc with Saturday coal deliveries. The future is always visible, but hard to decipher. Who’d have thought when grocer Leon Weinstein bought a coal yard at Dupont and Huron streets, somewhere around 1956, and erected a supermarket there a year or so later, that it was actually watershed. But it was a preview of Dupont’s post-industrial future, visible to the eye if not the conscious mind, even as the street’s industrial might yet grew. Weinstein was the Dave Nichol of his era—an outgoing, cigar-smoking marketer who parlayed a small grocery store at Coxwell and Danforth avenues into a chain of thirty-eight supermarkets. “Power” was the name they went under. It was lifted, the story goes, from a gasoline ad.20 The banner was a bit obscure but decisive and forward-looking; the moniker looked good on the new Dupont store (the Loblaws at Huron Street in 1998), showy and modernistic in a 1958-era photograph with the store against a background of Casa Loma’s medeival-looking towers on the Davenport hill. In front, the supermarket’s transparent glass wall overlooks Dupont’s archaic streetcar tracks. There was now, prophetically, a parking lot where coal had been piled, and a few blocks south rose the dust from construction whose future implications Weinstein must surely have understood. Along St. George Street, south of Dupont to Bloor, decrepit mansions were giving way to a brave new world of apartment blocks. These buildings signalled a sea-change, not only for architecture, of which they represented some of the city’s earliest, best and worst modernist examples, but the functioning of Toronto’s aging core, which, unlike U.S. cities, would receive a perennial tide of immigrants and young middle-class as industry moved out. For their needs they would require housing, Power, and much else—muffler shops, locksmiths, Birkenstock shoes—and Dupont Street, between its factories, would provide. Such juxtaposition has always been part of Dupont’s cityscape. As long as they cut gears and made hosiery, printing ink, paints, and rubber here, they have also given women permanents, and served twenty-four—hour breakfast in greasy spoons. (Hamilton Gear crews ate at Central Lunch; today, Vesta Lunch comes to mind: “All Day Steak and Eggs, $6.95.”) Cars have been made, sold, and wrecked on Dupont Street; at fierce-looking banks at key intersections deposits have been received and capital dispensed. Few think of Dupont as a neighbourhood. Its length and grunginess today may disqualify it. Yet people have always lived here and, to a surprising degree, identified with the street. Displaced by the Hungarian uprisings of 1956, Susan Stiasny’s family arrived in Toronto the next year, renting an upstairs apartment on Dupont Street above what is, in 1998, the Red Raven, a pub. To her five-year-old sensibilities Dupont was the centre of the universe. In her overgrown backyard, tight against the C.P.R. tracks, she and her brothers cleared enough brush to create a pile of cuttings so deep they could jump into it from a second-storey window. Another picture of Weinstein’s Power store shows, in the window, a coin-operated rocket ship for the kids to ride, if they could cajole their Cold War-displaced mom to give up the nickel. For a privileged few out in the larger world, Dupont itself was an escape. 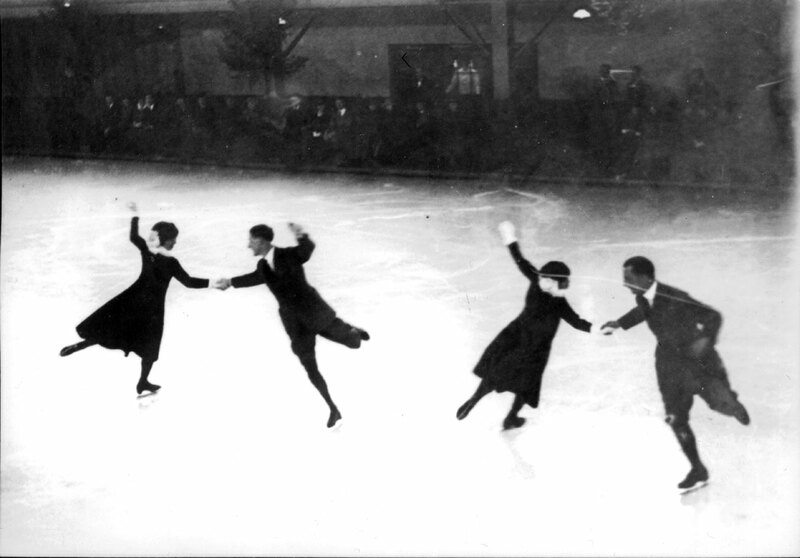 There is a photograph in the Toronto Reference Library of Clifford Sifton, Katherine Capreol, Sydney Pepler, and Melville Rogers performing a figure-skating manoeuvre on the indoor rink of the Toronto Skating Club, an arena which was built on the north side of Dupont Street near Manning Avenue in 1922. Minus its ice, the club, somewhat mysteriously, is still there, right down to its original wicker furniture. In 1957, Imperial Optical magnate Sydney Hermant, an avid tennis player, led a group which purchased the building and converted it into an indoor tennis club. The front door is always locked (members have keys), and membership is by invitation; it includes, at this writing, former prime minister John Turner and former M.P. and cabinet minister Barbara McDougall and one wonders if the two, who once sat opposite each other in the House of Commons, have ever faced off at tennis on Dupont Street. The handsome building’s unused look is probably registered as an asset by club members, who presumably value the privacy they can find on Dupont more than any pretension which they cannot. Two couples at the Toronto Skating Club, Dupont and Manning, 1922. Dupont is a street transformed from century’s beginning, yet in fundamental ways the same. If you walked it, as I did in 1998, from its junction with Dundas Street in Toronto’s west-end, to where it halts abruptly at Avenue Road six kilometres east in midtown Toronto, you would see that it has changed from a place where you earned money, to where you spend it, but neither grown beautiful nor much uglier. You would walk past a Lamborghini showroom, a Jaguar dealer and one of the biggest, flashiest supermarkets in the country. You would walk past crummy warehouse stores that sell everything from lawn ornaments to used computers. There is a specialist in supplies for babies, a billboard with a ten-foot image of Albert Einstein’s face hawking Apple computers, and a pop art-era subway entrance that looks like a bubble stuck to the ground. There is little graffiti, little litter; there are still overhead wires and blocks and blocks of small semi-detached homes whose yards and porches, assaulted first by heavy industry and later by heavy traffic, put a mean mask on the surely varied existences within. But keep looking, keep peeling back the layers of wear and time, and Dupont Street begins to change. Let us return to Dovercourt Road and Dupont to revisit, in 1998, the green glass house at what was Hamilton Gear, which still stands. There is a chance, quite good, that the paper you are reading this on came from a mill whose equipment still relies on Hamilton gears, cut in the green house on Dupont Street. It is a certainty that every ship that has passed through the St. Lawrence Seaway—and thus every shipment—has been accommodated by Hamilton gears from Dupont Street, because they open and close the locks. The nickel in your pocket may owe a debt to Hamilton gears made for Inco or Falconbridge. Hamilton’s resource-generating, nation-building gear customers also included Cominco, Placer Dome, and Noranda. Hamiltons were ordered from Dupont Street for the great Polaris mine on Cornwallis Island (seventy-six degrees north, ninety-seven degrees west), Northwest Territories. Throughout the day, today, Canadian National trains will cross lift bridges, such as that crossing into Vancouver over Burrard Inlet, that are lowered and raised by Hamilton gears, cut and machined on Dupont Street in Toronto. Forty years ago, when the supersonic Avro Arrow jet was launched, Hamilton gears, machined to perfection on Dupont Street, opened and closed the pilot’s canopy over the cockpit. Far into the future, a great radio astronomy telescope in Green Bank, West Virginia will still follow the stars on mechanisms driven by Hamilton gears, made on Dupont Street. When you know all this, Dupont Street, so flat, long, and gritty, rises to heights. It is a place where visions and acheivements far-reaching, even spectacular, began. In ways unseen, unrecorded, Dupont Street in Toronto was one of the places where the twentieth century, now at a close, was made. Donald Weston graduated from Western Technical High School and joined Hamilton Gear in April, 1952. In 1998 he was living in Weston, part of Toronto. Jennifer Bain, “Furniture Factory Lofts Have Link To Long Industrial Past,” Toronto Star, May 6, 1998, sec. P, p. 1. “Assembling Plant For Toronto,” Ford Times, 8, no. 1 (March, 1914): 341. Pioneers of Progress, (Toronto: Canadian General Electric Company, ca. 1940), promotional booklet. Photographic reproductions of architectural iron work executed by the Canada Foundry Company head office and works, Toronto, catalogue no. 11. William Ferguson, in E-mail to author, July 26, 1998. “Street Signs 150 Years Old? Cheer Up, New Ones Coming,” Toronto Star, Sept. 9, 1947, p. 5. Eric Arthur, No Mean City, (Toronto: University of Toronto Press, 1986), 279, 280, 286, 292. Sinclair Lewis, Babbitt, (New York: Harcourt, Brace and Company, 1922), 2. Margaret Spence, phone conservation with author, August, 1998. Her father was manager of American Standard’s Dupont plant from 1935 until 1969. George Seldes, Witness to a Century (New York: Ballantine Books, 1987), 215. “Giant Planes Ready To Start Test Flight Across the Atlantic,” Globe & Mail, July 5, 1937, p. 1. “Another Step in Toronto’s Grade Separation,” Contract Record and Engineering Review, (February 10, 1926): 116. Phoebe Snow ad for the Lackawanna Railroad, ca. 1910 postcard, republished by the Anthracite Museum, Scranton, Pa.
James Kendle, interview with author, August 1998. Kendle now lives in Willowdale, Ontario. George Gamester, “Charlie and Jim Shovel Their Last Ton of Coal,” Toronto Star, March 25, 1986, p. A2. June Callwood, “The Informal Leon Weinstein,” Globe & Mail, June 16, 1975, p. 8. This list of projects is from the corporate archives of Hamilton Gear, rescued by Donald Weston and comprising a wide range of records, advertising, photographs, and files. For assistance on this project the author would like to thank Don Weston, Margaret Spence, James Kendle, William Ferguson, Susan Stiasny, and Donald Hood; also Alec Keefer of the Architectural Conservancy of Ontario, Sally Gibson of the Toronto Archives, Sandra Notarianni and Anthony Fredo of the Ford Motor Company, and George Gamester of the Toronto Star. Alfred Holden is a contributing editor with Taddle Creek. He was an editor and reporter with the Toronto Star for nearly thirty years. He contributed to the books Concrete Toronto and uTOpia: Towards a New Toronto. His Christmas, 2000, Taddle Creek essay, “The Streamlined Man,” was nominated for a National Magazine Award, and he was awarded a Heritage Toronto commendation for his work in Taddle Creek and elsewhere. He has contributed to the magazine since 1997. Last updated winter, 2017–2018.